Preheat the oven to 350°F. Spray two cooling racks with nonstick cooking spray and set them into baking sheets. Cut chicken breasts into 1-inch cubes. Cut bacon slices into thirds. 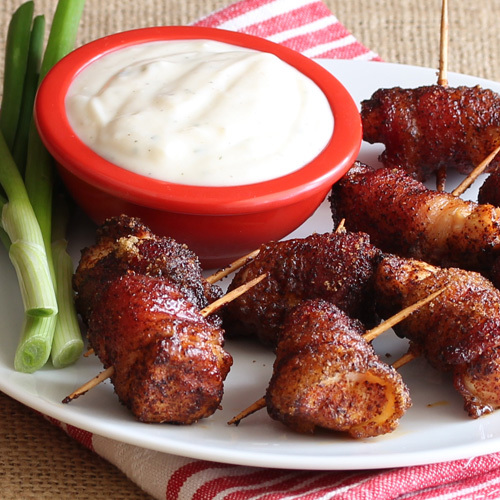 Wrap each chicken cube with a slice of bacon securing with a wooden toothpick. In a large plastic bag combine brown sugar, chili powder and cayenne pepper. Drop 4 to 5 wrapped chicken cubes into the bag and shake to coat the cubes completely. Place coated chicken cubes on the prepared racks. Repeat until all the chicken has been coated. Bake the chicken for 30 to 35 minutes, or until the bacon is crisp. Serve warm with ranch dip.